A very shimmery bath melt, this gorgeous star slowly fizzes away to unleash a rainbow of colors. The bar is made with murumuru butter and oils of ginger, lavender, almond, and lime so not only does it smell zesty fresh, it also lightly conditions the skin. With a delightfully potent and sweet fruity-floral fragrance, this is a giant bubble bar infused with oils of Sicilian mandarin and petitgrain. You can easily divide it up for multiple uses but I went all in and got a super bubbly and purple bath. 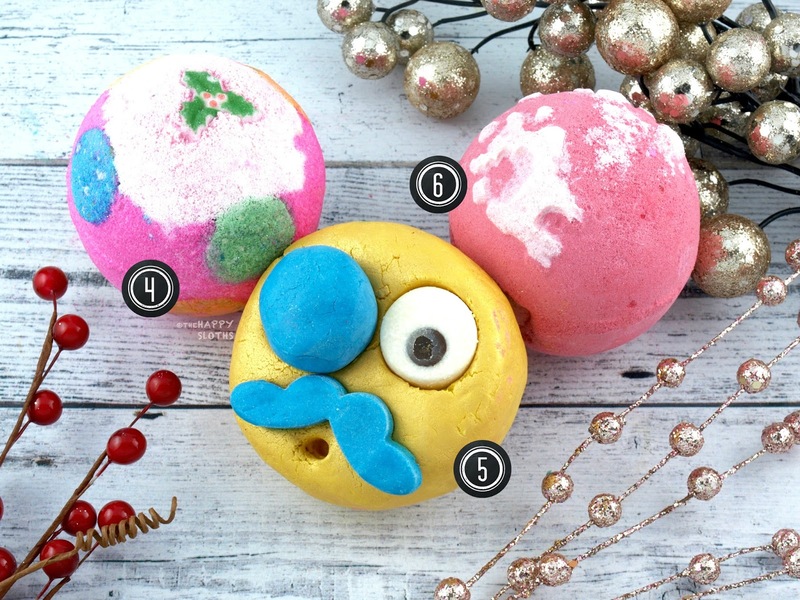 Molded like the cutest little snowman, this is a citrusy bubble bar that's made with cocoa butter, lemon oil, and lemon myrtle oil. To use, crumble under running hot water and watch the bubbles grow! 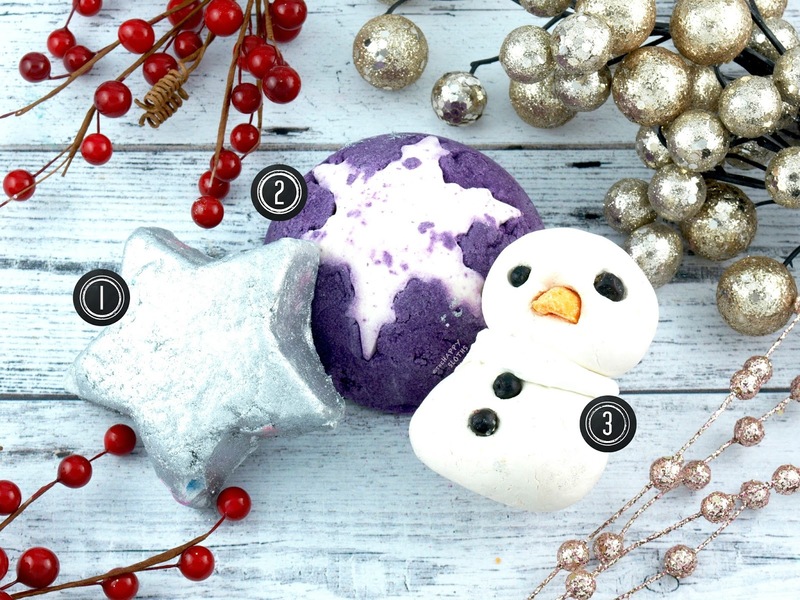 A Christmas classic from Lush, Luxury Lush Pud is a multi-colored bath bomb scented with the relaxing fragrances of lavender, tonka beans, ylang-ylang, gardenia, and benzoin. For a comforting bath with a rainbow of pastel colors, definitely give this a try! Similar to Plum Snow, Man in the Moon is a giant bubble bar packed with nourishing cocoa butter and olibanum oil. It turns the bath water green and provides a nice and refreshing citrus fragrance thanks to the lime and neroli oil. Inspired by festive Christmas sweaters, this bath bomb looks white and red on the outside but fizzes away to reveal a bright orange center. Also made with oils of ginger, coriander, clove, and lemon, the bomb has citrusy and spicy fragrance. Probably my favorite item out of the bunch, this is a beautiful, hand-crafted soap that looks and smells exactly like a juicy pair. 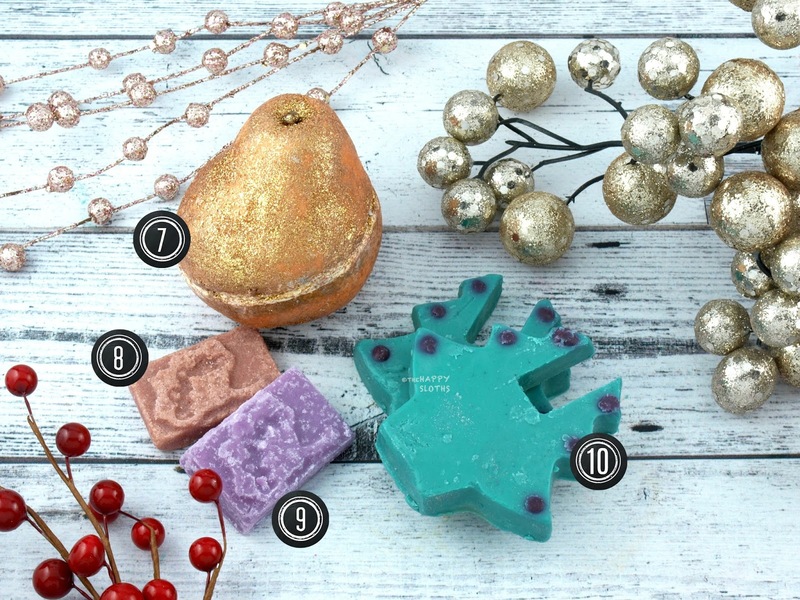 Made with cocoa butter, coconut oil, pear puree, orange oil, and murumuru butter, the soap is coated with a thick dusting of plastic-free golden glitters. I think it's also embedded some of the same glitters but they are hardly noticeable after a few uses. If you thought everything at Lush smelled amazing, then you've got to give this sniff because the scent is on a whole other level! Lush introduced the Naked Lip Scrub as part of this year's Halloween Collection and thanks to the overwhelmingly positive reception, two new flavors are being introduced for the Christmas Collection. Made with sugar, murumuru butter, illipe butter, coconut oil, and jojoba oil, this one here is the naked version of the iconic cola-flavored Santa Baby lip scrub. Instead of being loosely packed in a jar, the scrub is pressed into a solid tile that works beautifully at exfoliating and moisturizing the lips. With a yummy blackcurrant scent, this is another popular holiday lip scrub flavor compressed in a bar form. To use, simply wet the lips and buff away. Because all the ingredients are natural and edible, you can just lick off any excess to reveal soft, smooth lips. With a cheery bright green hue and a refreshing citrus scent, this is a cocoa butter bath melt designed to add an extra touch of luxury and moisturization to your bath. The product comes with two separate pieces that you can put together to form a three-dimensional Christmas tree but as you can see, Lush dropped the ball with my order and my Tree D arrived with two identical pieces that can't be put together to form a proper mini tree.... but oh well, it stills does the job! 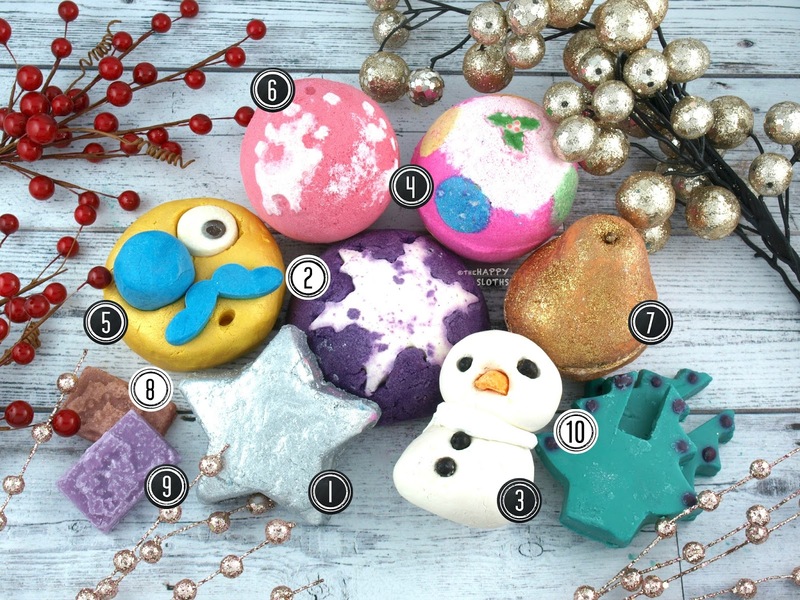 What will you be picking up from the Lush Christmas Collection this year? Share with me in the comments below!